The genus Amietophrynus was split from Bufo by Frost et al in 2006. Most references still use the long-established Bufo. There's still controversy in the ranks of amphibian taxonomists about this split, but since the SSAR names book follows the split for North America, I'm also following it for the rest of the world. Then in 2016 Amietophrynus was renamed to Sclerophrys following museum specimen detective work by Ohler and Dubois. This was a pretty generic looking toad, perhaps 4 inches long. It was hopping about in the camp near the dining area. I couldn't find enough information about the toads in this area to identify this guy until I got a copy of Channing and Howell's recent guide to East African Amphibians. Amietophrynus gutturalis is similar, but the shape of the paratoid glands and the size of the tympanum makes me think this is A. maculatus. On the other hand, Stephen Spawls's recent guide to herps of Maasai Mara lists S. gutturalis as known to be present in the park and S. maculata only as suspected to be present. 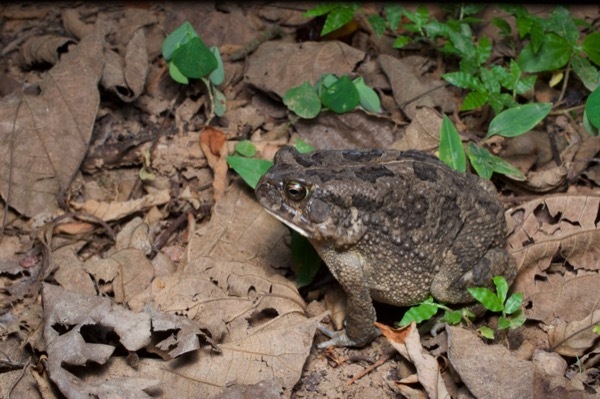 A few of these fat and happy toads appeared on the grounds of the Bobiri Reserve lodge each night around dusk. We could see them from a distance on the deck from which we ate our dinner. I never saw any when we went out in the forest or along the dirt road for a night hike though; apparently they had discovered that the finest toad dining was under the artificial lights of the lodge. 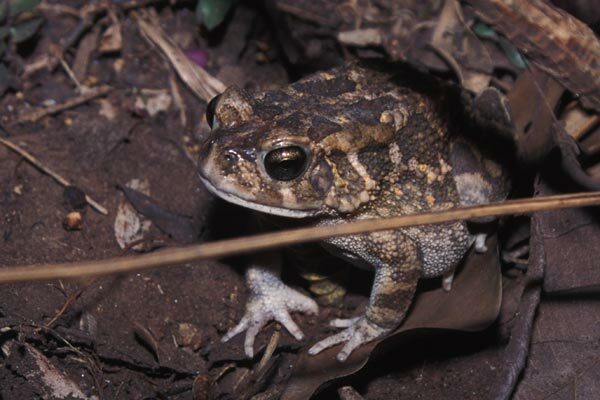 Thanks to Ghana frog expert Caleb Ofori Boateng for identifying this toad.